Celebrate Judith's Jig 8th Anniversary! Judith’s Jig Memorial 5k is truly a special event because it celebrates the life of Judith Patterson Gilbert, whom many people in our community will never forget, including her BPW (Business and Professional Women’s Club) sisters whom which have organized this event. Judith belonged to many organizations and was one of the founders of High Tech Computing, Inc. Judith passed away on April 2, 2010 after an eight month battle with pancreatic cancer, but leaves a legacy of kindness, caring, and giving back. In conjuction with the Jack Curtain St. Patrick's Day parade, Judith's Jig encourages all to make it a community wide celebration! Whether you're a sponsor, runner, walker, or volunteer, you're helping raise funds for three causes that were very near and dear to Judith's heart. Women's Services of Meadville has been providing hope and resources for those affected by violence and advocating to end it since 1977. One hundred percent of the proceeds that Women’s Services receives will go directly to supporting services and programming. With restrictions and cuts to local, state and federal funding in years past and the current state budget impasse, events like Judith’s Jig are vital to our ability to provide support and services not permitted by traditional funding streams. For example, recently we had a guest who had left her abuser after many years and was going to move in with her sister who lived in another state. However, she had two tires that needed to be replaced in order for her car to operate safely. Fortunately, unrestricted donations like those we receive from Judith’s Jig allowed us to purchase two new tires and she was able to start a new life free of violence. CASA-Crawford County Court Appointed Special Advocate, who trains and provides citizen volunteers to advocate for the best interests of children who are invloved in juvenile court proceedings as a result of abuse and/or neglect. As a result of Crawford County CASA receiving a $5,000 donation from the Meadville Business and Professional Women’s Club, Judith’s Jig last March, CASA was able to train three new volunteers to advocate on behalf of five abused and/or neglected children in Crawford County. But more needs to be done as there are over 70 children who did not have a CASA volunteer. Because of generous and giving people like the Meadville BPW and the community, CASA can continue to focus on its mission to increase the number of children served, ultimately working towards the goal of providing a CASA volunteer for every child who needs one. The Pancreatic Cancer Action Network is dedicated to working together to advance research, support patients and create hope for those affected by pancreatic cancer. Judith's Jig joins with PCAN to 'Wage Hope' by dedicating the funds raised to reseach to double the 5 year survival rate by 2020 (which is only 6% currently). AWARDS: Age group awards for Males & Females to the top 3 runners & to the top 3 walkers, in each age division: 10 and under, 11-14, 15-19, 20-24, 25-29, 30-34­, 35-39, 40-44, 45-49, 50-54, 55-59, 60-64, 65-69, and 70 & over. REFRESHMENTS / FACILITIES: Free refreshments & snacks to all participants. Restrooms & changing facilities are available at the YMCA and the Chamber of Commerce. All walkers runners are encouraged to come dressed appropriately for any weather conditions. ENTRY FEE: Preregistration: $20, must be postmarked or online by February 25, 2018. After Feburay 25 is $25 for all runners & walkers. 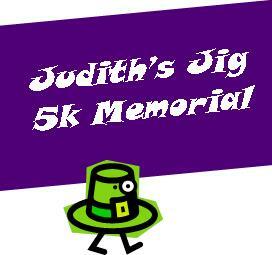 Checks are payable to Judith’s Jig 5K. RACE INFORMATION: Please by email at judithsjig@gmail.com. The race directors reserve the right to reject any entry for any reason. Those exhibiting poor manners towards motorists and other runners, reckless behavior, or not obeying the traffic marshals will be DQ’d. EARLY PACKET PICKUP: from 4 PM - 5:30 PM FRIDAY, MARCH 15TH you may pick up your packet early at the Chamber office at 908 Diamond Park, Meadville, PA.
RACE DAY PACKET PICKUP AND REGISTRATION: from 9 AM - 9:45 AM Race Day at the Diamond Park. Get there early and beat the last-minute rush at the race! Pre­registered runners & walkers will receive goody-bags, chips, and shirts. Last minute registering runners & walkers will receive the same as supplies last (note that race-day registration prices apply). The race will begin at 10 AM sharp!